Classy Glasgow Warriors overwhelmed Zebre to secure a home Pro12 play-off semi-final tie against Munster. The hosts had made sure of a bonus point within the first 20 minutes as Stuart Hogg crossed twice and Ryan Grant and Al Kellock also touched down. Alex Dunbar and Niko Matawalu also went over for the Warriors before the break, with Duncan Weir's kicking extending Glasgow's lead to 40 without reply. Geoff Cross and Matawalu added converted tries after the turnaround. Gregor Townsend's side will return to their Scotstoun ground to face Munster next weekend, with the winner progressing to take on either Leinster or Ulster in the final. 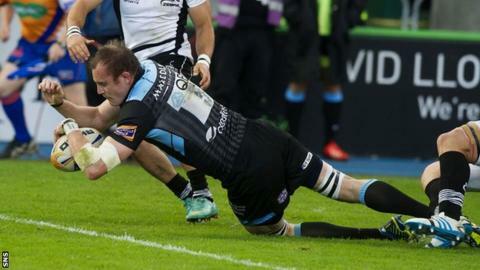 Glasgow's intent was clear from the off as a sweeping move right to left led to Hogg running in an early score. Weir converted. The Warriors wanted double figures quickly and Weir's drop-goal attempt just slipped under the crossbar. But Grant soon forced his way through to touch down and Weir added the extras. The Scotland fly-half then thought he had a try to add to his kicks but a forward pass earlier in the move brought play back. Captain Kellock brushed off an altercation with Quintin Geldenhuys at a scrum to add to the Warriors' lead, spinning away from a ruck to cross. Weir maintained his record with the boot. And Hogg received Peter Horne's pass to run in his second try on the right, but on this occasion Weir's kick was wide. Dunbar crossed from a similar move and Weir found his range again. In a rare foray forward Zebre thought they had scored but fell just short and soon Glasgow were countering to great effect. Dunbar and Hogg kicked along the ground and the latter then chased for the touch down, but it was his team-mate Matawalu who got there first. Weir kicked a simple conversion. As the rain lashed down in the second half, there were fewer scoring opportunities. Still, there was a determination from the hosts to entertain the near-6,000 crowd and Cross went over after some forceful play. Weir made it six out of seven with the boot. And Peter Murchie's off-load set Matawalu off on a mazy run which ended with the eighth try of the evening. Weir's replacement Ruaridh Jackson converted. Glasgow: Hogg, S. Lamont, Dunbar, Horne, Matawalu, Weir, Pyrgos, Grant, MacArthur, Low, Swinson, Kellock, Eddie, Fusaro, Nakarawa. Replacements: Murchie for Hogg (43), Jones for S. Lamont (74), Jackson for Weir (67), Yanuyanutawa for Grant (53), Hall for MacArthur (57), Cross for Low (57), Harley for Swinson (65), Holmes for Fusaro (53). Zebre: Odiete, Toniolatti, Garcia, Venditti, Berryman, Iannone, Palazzani, Perugini, Giazzon, Chistolini, Geldenhuys, Bortolami, Bergamasco, van Schalkwyk, Vunisa, Cristiano. Replacements: Chillon for Odiete (44), Aguero for Perugini (43), T. D'Apice for Giazzon (44), Ryan for Chistolini (38), Biagi for Bortolami (46), Caffini for Bergamasco (78), Cristiano for van Schalkwyk (9), Ferrarini for Cristiano (62).